This image of the massive galactic cluster IDCS 1426 combines data taken by three major NASA telescopes. The off-center core of X-rays is shown in blue-white near the middle of the cluster, and was captured by Chandra. Visible light from the Hubble Space Telescope is green, and infrared light from Spitzer is shown in red. KISSIMMEE, Fla. ─ The most massive collection of galaxies in the early universe has been spotted. Although not the largest collection of galaxies ever found, it holds the record as the largest group in the early universe, appearing surprisingly old for the time. "Of all the structures we've ever seen, this is the most massive in the first 4 billion years of the universe," astronomer Mark Brodwin, of the University of Missouri at Kansas City, said at a news conference unveiling the discovery here at the 47th annual meeting of the American Astronomical Society. Brodwin led the team that identified the evolved ancient galaxy cluster. Galaxy clusters are collections of galaxies that formed once stars and individual galaxies had been built. Gravity binds hundreds of thousands of galaxies together in collections so large, they can distort the fabric of space-time. According to present understanding, the massive objects should take billions of years to form. Initial estimates suggested that IDCS 1426 contained an enormous mass at a significant distance, but were not conclusive. Brodwin and his colleagues decided to use NASA's Hubble Space Telescope, Keck Observatory and Chandra X-ray Observatory to refine measurements of the mass of the cluster, using three different methods. Hubble and Keck studied IDCS 1426 in optical light. Because clusters bend space-time, they are frequently used as natural magnifying glasses to observe objects behind the cluster in a process known as gravitational lensing. A more massive cluster produces a higher gravitational force that bends the light more strongly; by observing how the light traveled around the cluster, the scientists could calculate its weight. At the same time, Chandra studied the object in the X-ray wavelength. 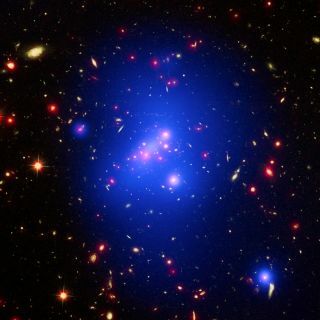 The more massive a galaxy cluster is, the more the gas within it is compressed and heated, producing more X-rays. By observing those X-rays, the scientists were able to compute the mass of the cluster. All three observations independently provided a mass 250 trillion times higher than the mass of the sun, or 1,000 times more massive than the Milky Way. IDCS 1426 is not the most massive galaxy cluster in the universe. That distinction is held by a massive cluster that lies only 7 billion light-years from Earth. Known informally as 'El Gordo,'the hefty cluster weighs in at a whopping 3 quadrillion times the mass of the sun (that's 3 followed by 15 zeros, or one thousand million million). However, according to Brodwin, the cluster is on track to grow into something that large. "Statistically speaking, it is a progenitor of 'El Gordo,'" he said. After another 3 billion years, the ancient collection should weigh in fairly close to the larger cluster. The research will be published in The Astrophysical Journal, though a preprint of the study is available on the site Arxiv.org. The enormous mass of IDCS 1426 in the early in the life of the universe isn't the only indication of its unusual evolution. In addition to studying its mass, Chandra also took the temperature of the heart of the distant cluster, and found something surprising. The core of a galactic cluster is an active place, with objects moving around and bumping into one another. This ongoing activity keeps the core hot for the cluster's early lifetime. Once things slow down, however, conditions in the core begin to relax, and the center begins to release energy in the form of X-rays, causing the center to slowly cool. Chandra revealed a bright knot of X-rays at the center of IDCS 1426 that were surprisingly cool. In fact, it is the first "cool core" cluster at such an early age in the universe. The cool heart of the cluster provides even more evidence for its formation early in the life of the universe. "A cool core is a property of an evolved cluster," Brodwin said. A collision may have added the extra kick to the formation of the young cluster. The cool core lies not in the center of the IDCS 1426 but off to one side by a few hundred thousand light-years. "When it is hit by another group or cluster, the cool core will slosh around like wine in the bottom of the wine glass," Brodwin said. "Eventually it will settle towards the center, but it hasn't settled yet." All of these suggest an advanced age for the cluster that came as a surprise for a feature so early in the life of the universe. "The cluster looks at least a billion years old," Brodwin said. "It probably really started forming 2 to 3 billion years earlier, which is very early for something of that size."